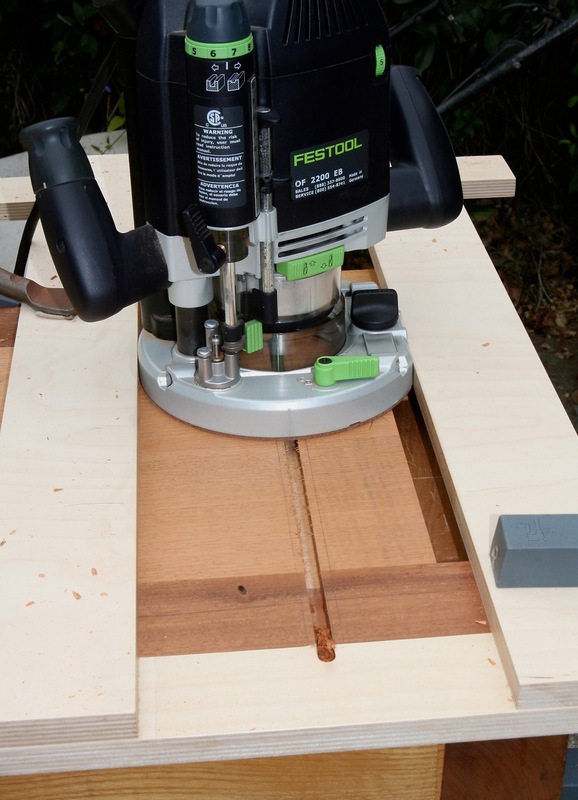 The Wood Whisperer Guild (subscription-based) produces three or four projects a year which include extensive plans and step-by-step videos released weekly over a couple of months. Host and producer, Marc Spagnuolo, has a style of presentation which I find a most enjoyable way to deepen my understanding of tools, techniques and process. 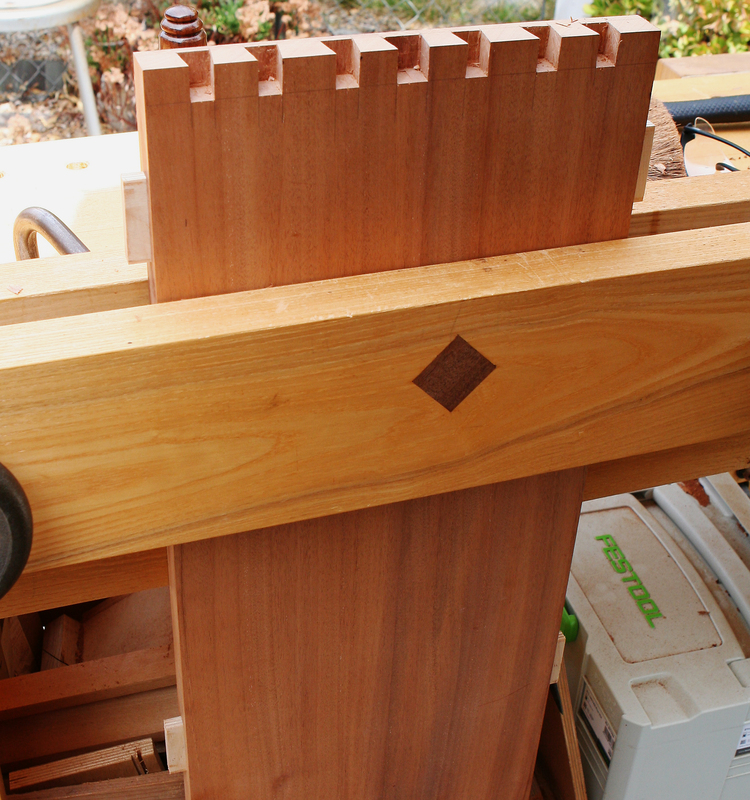 The Roubo Workbench is the only Guild Build that I’ve created, but I have been a member since day one. 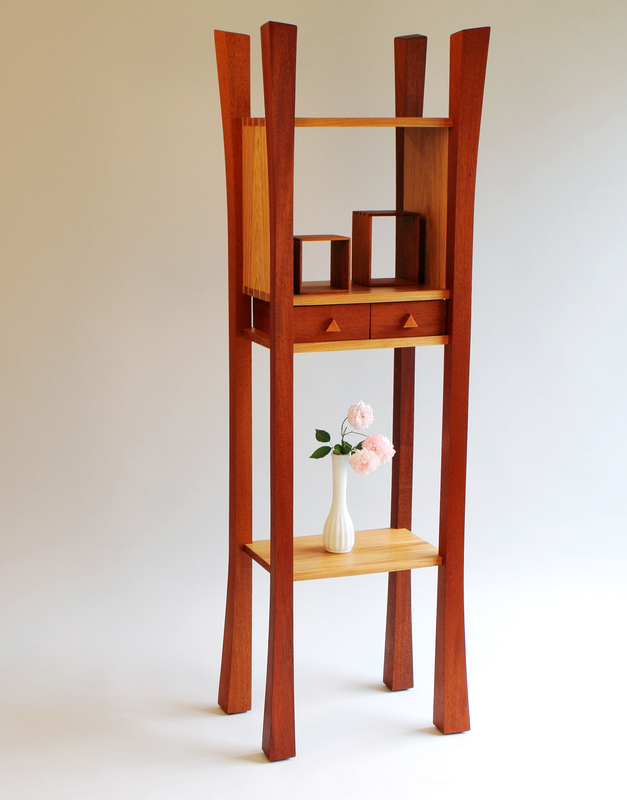 In most projects Marc offers suggestions for other approaches and options for personalizing the design. 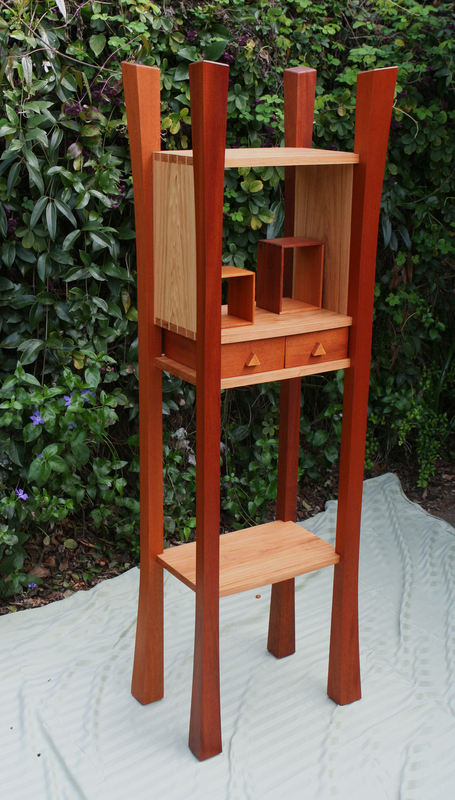 This fall, Marc will be creating a Krenov-inspired display stand based on one I made in 2013. It will be interesting to see how he interprets this form. Below are some photos of my 2013 build. 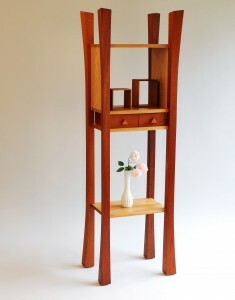 My talented friend, woodworker and blogger, Marilyn Guthrie, made a brave post showing a proposed new logo and asking for comments. Having dabbled in typography and the design world for many years, I added my two cents. She received numerous other constructive criticisms, suggestions and encouragements. After seeing her round two version, I decided to return to her initial attempt and make some refinements. She liked it and it is now the official logo. 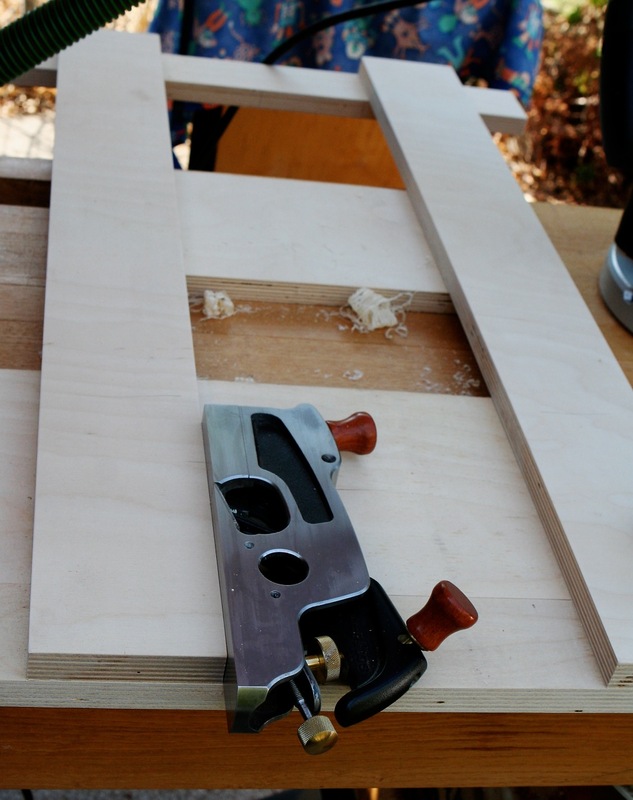 You may wish to subscribe to her blog if you enjoy examples of hand tools in operation, presented in an inspiring manner. I am a sucker for good photography and people indulging in their creative passions. I am a fan. 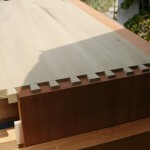 I am creating centered drawer guides for this project. 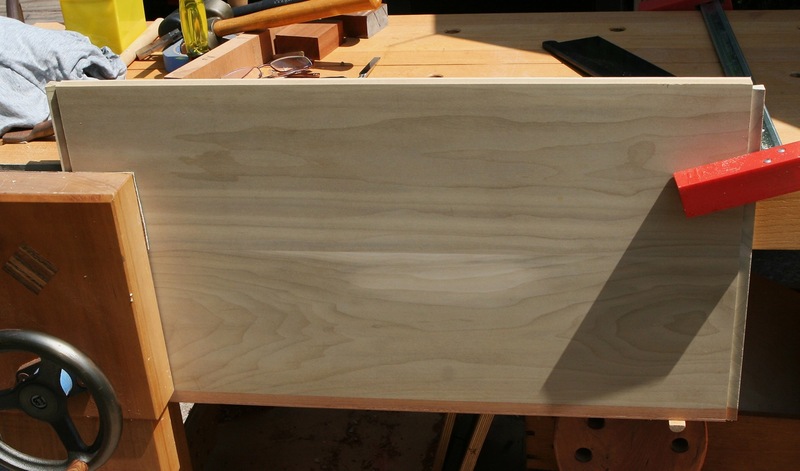 The objective is to lessen racking potential with the (mostly) wide drawers, as well use the opportunity to try a new approach. There are two types of one-inch wide guides: for two full-shelves (fixed horizontal shelf and case bottom) and for three web frames. 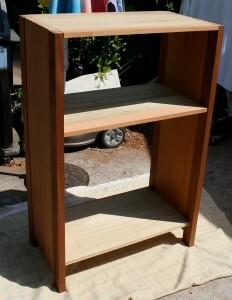 The upper web frame will support two narrower upper drawers. 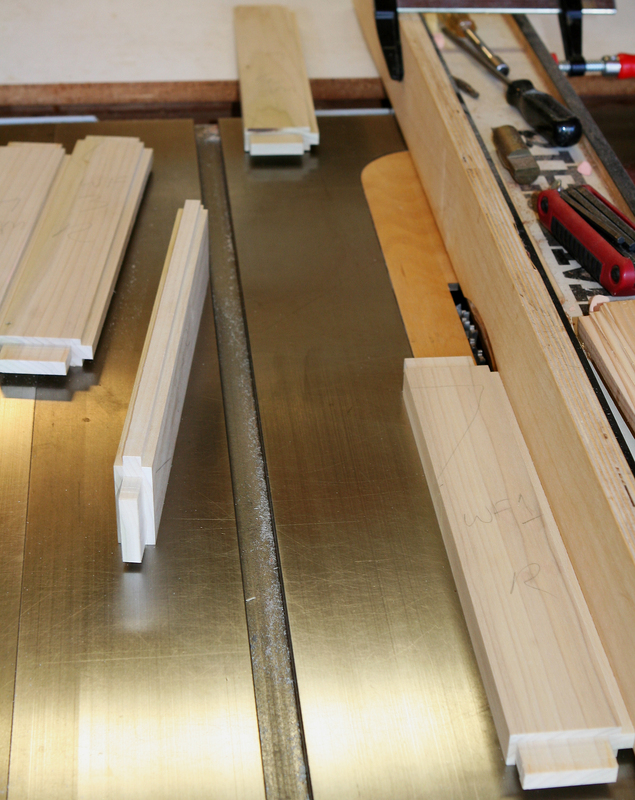 Guides for fixed shelves will be 1/4 inch proud set in 1/8 dadoes. 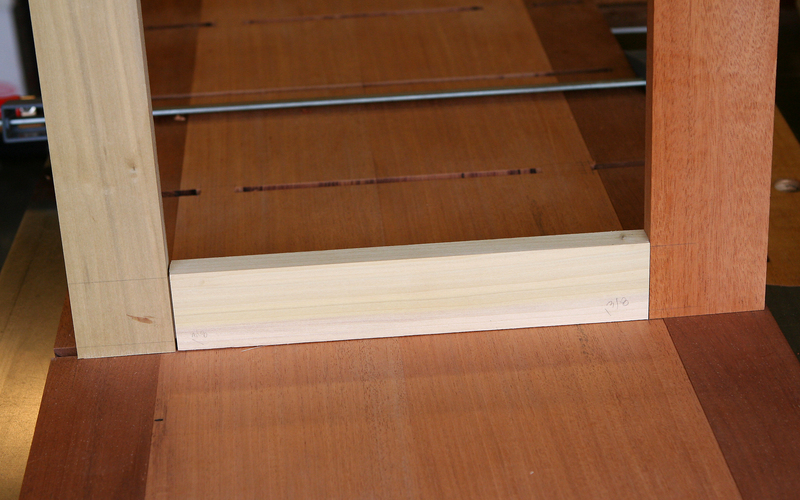 These guides will be glued into the front portion of the dado and allowed to float beyond that allowing for wood movement. The web frame guides (4 of these) are fixed into the front frame member and allowed to float at the rear. 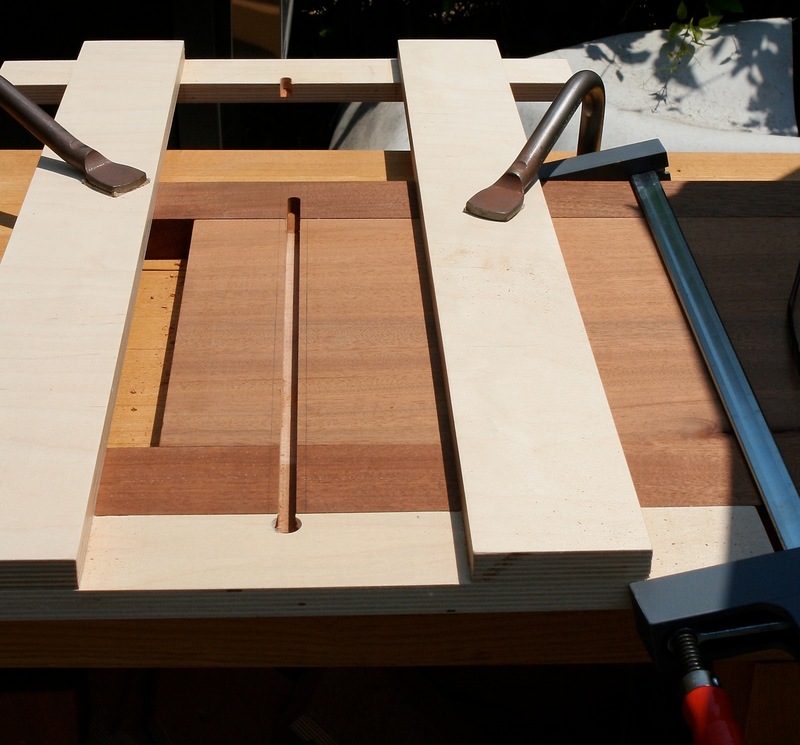 The case bottom will be attached to the side assemblies using stopped, sliding dovetails. 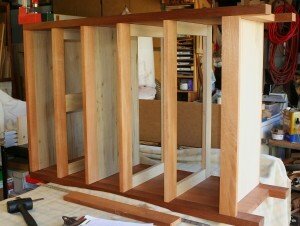 One of the horizontal dividers will be a full shelf and similarly attached. 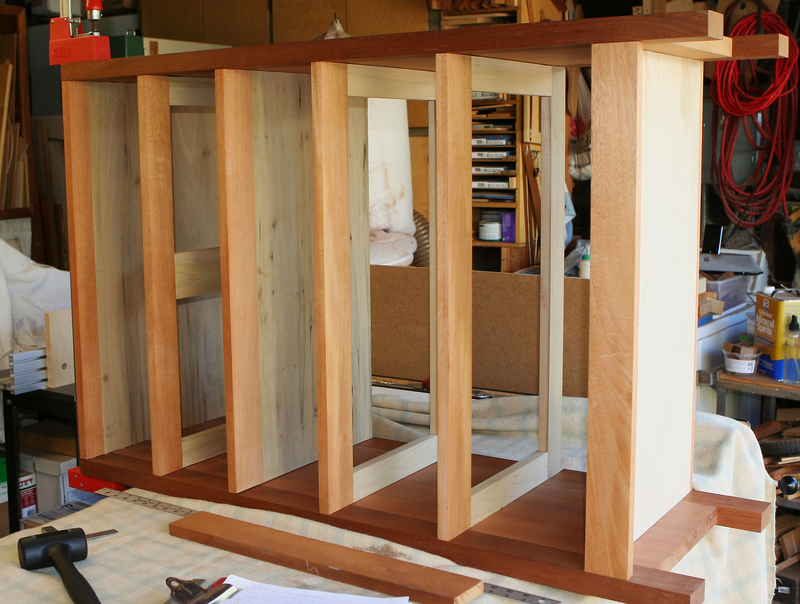 The bottom shelf will be fronted by an apron attached to the legs with mortise and tenon and glued to the shelf. 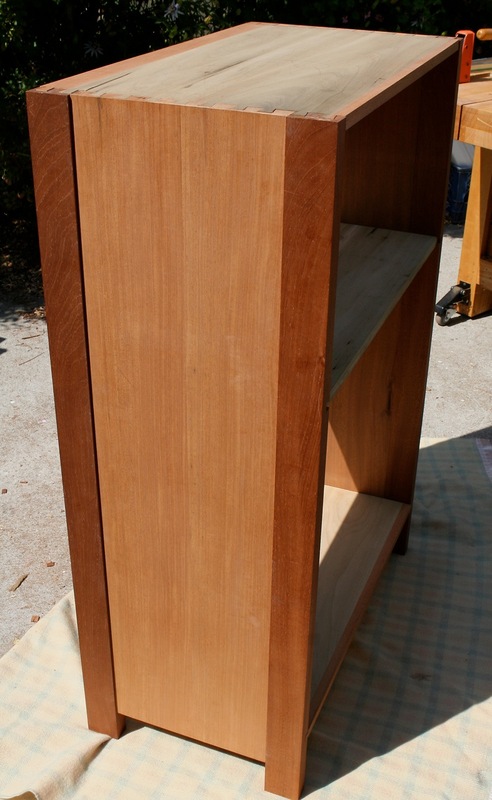 Which means that no mahogany is necessary on that work piece. 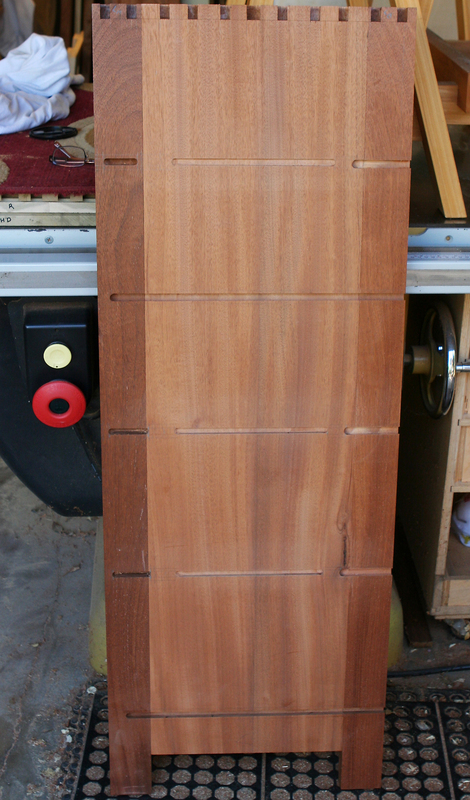 The horizontal divider has a three inch strip of mahogany for the show edge but no back mahogany edge as that will be behind the case back (design of which is still being pondered). 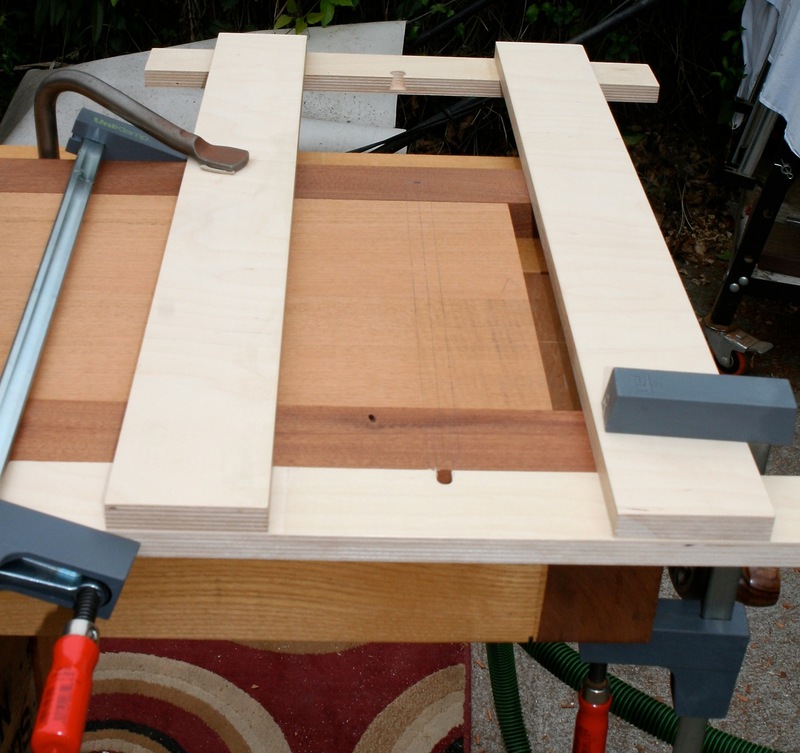 The router jig shown is from Marc Adam’s timely FWW #282 article. 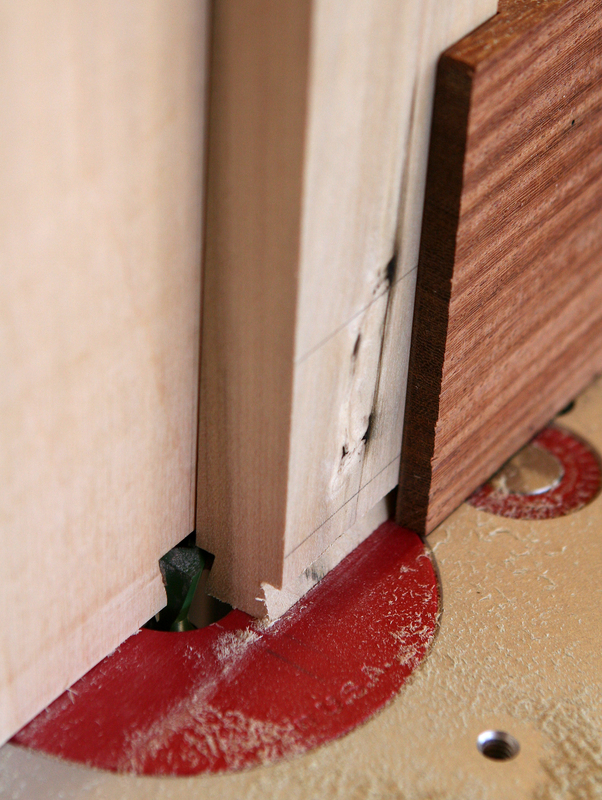 A dado is routed with a 3/8 inch straight bit just shy of full depth (1/2 inch) in two passes. 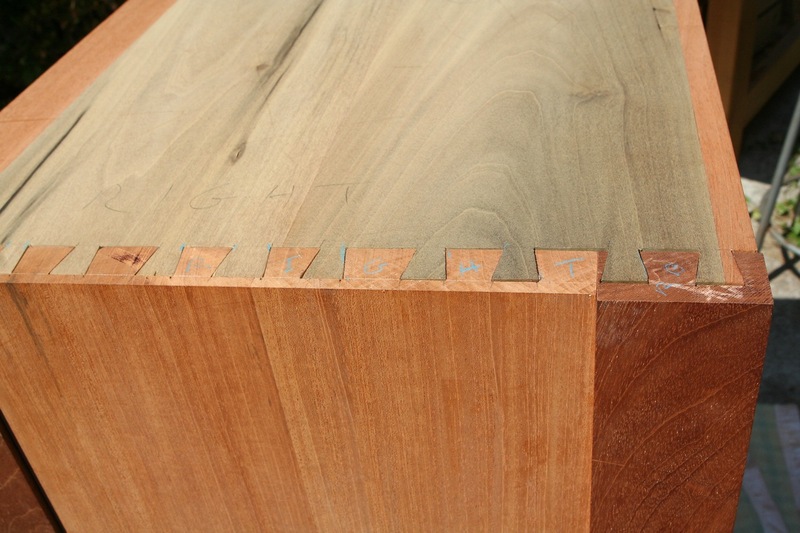 After the four dadoes are cut, the jig is reversed, aligned and the sliding dovetails cut in one pass with a 14 degree dovetail router bit to 1/2 inch deep. 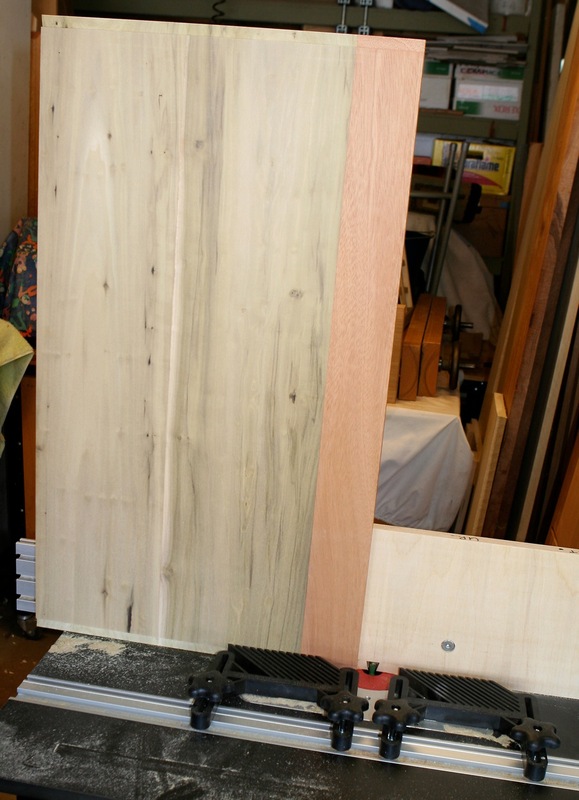 Next the two panels of poplar are glued up and milled to approximately 3/4 thick with edges of mahogany where appropriate. 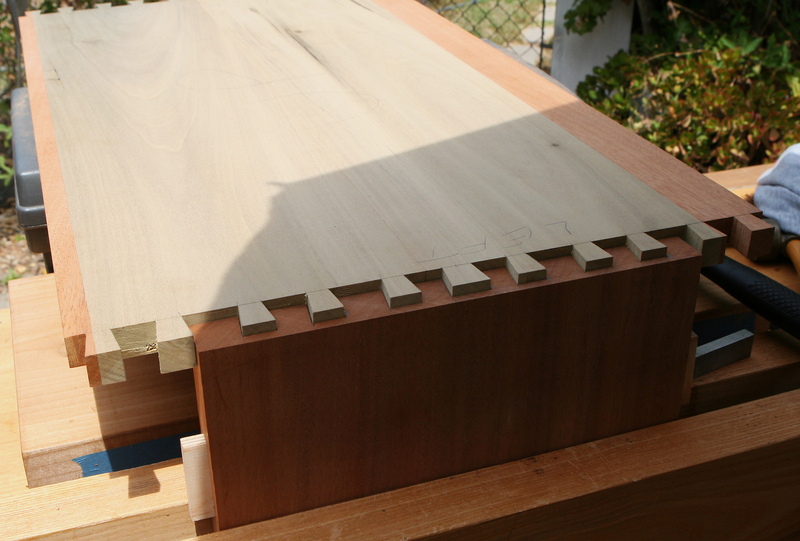 These panels will have sliding dovetails cut to fit the case side dovetail slots. 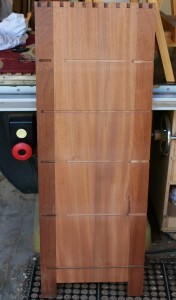 Fitting the case top to side panel. The case top is attached to the side assemblies with half blind dovetails. 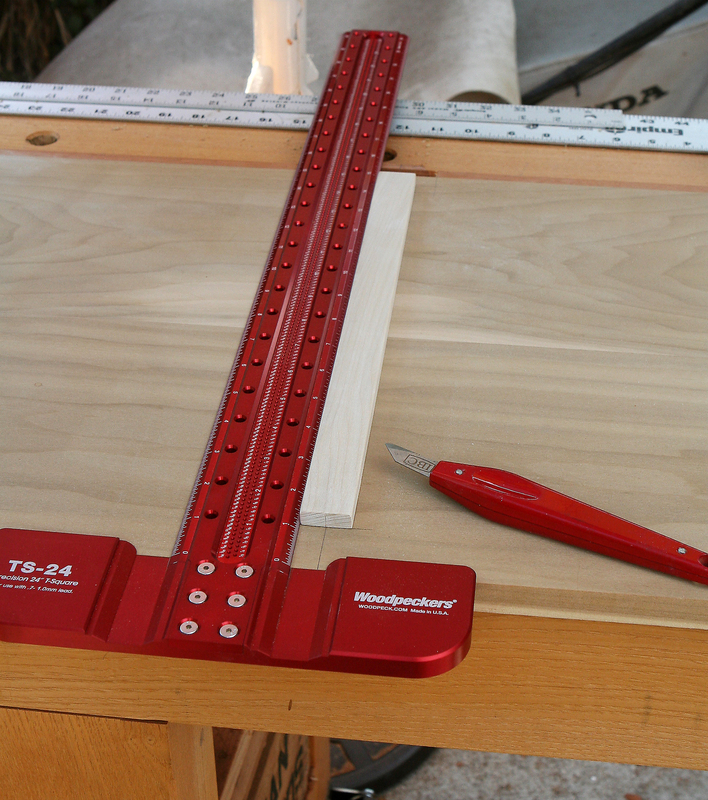 I began by marking and cutting the tail board (case top). Generally, I would have made the tails much wider than the pins, but as I am working without much in the way of plans, my brain got twisted around just a bit. Structurally they should be just fine, but they do look somewhat odd and it is more difficult to keep track of the tails and pins. 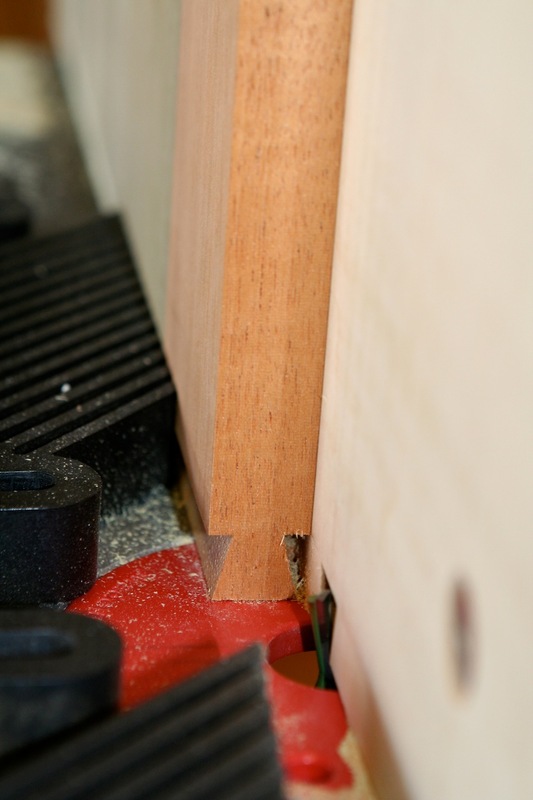 In the past, I’ve used a router or drill press to hog out waste on the half blind tail boards (sides) to establish a nice reference surface. I did get out the router and began to set it up, but was not comfortable that I could see my boundaries well. I realized I’d be much more comfortable using the saw, chisels and mallet. Fun stuff. 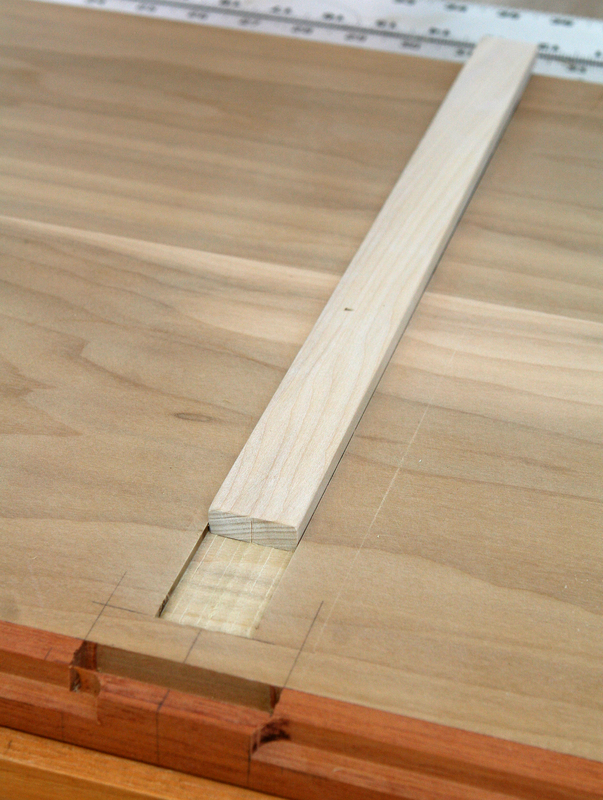 Next up will be a stopped sliding dovetail to attach the case bottom to the sides. I will use the nasty router for that operation.